Avenida Paulista is an energetic, commercial center of São Paulo, where a lot of the high-powered business in Brazil takes place. Office buildings, shopping centers, apartment buildings and museums, some with innovative architecture, line the busy, wide avenue. Most of the buildings are modern, but walking down São Paulo’s busy Avenida Paulista one day, I noticed a somewhat weathered, old mansion standing near a copse of trees. Despite its graffiti-scribbled walls, I could still appreciate the mansion’s ornate, eclectic style. At first, the mansion appeared to be abandoned, but through one of the windows, I could see a chandelier and some furniture. I knew that in the past, the coffee barons of São Paulo, who made fortunes cultivating and exporting Brazilian beans in the late nineteenth and early twentieth centuries, built elegant mansions all along Avenida Paulista. However, most of these mansions have since been demolished to make way for modern skyscrapers. Curious about the mansion, located at Avenida Paulista 1919, I decided to investigate. Through some research, I learned that the mansion, known as the Residência Joaquim Franco de Mello, was built in 1905 and designed by Portuguese architect, Antonio Fernandes Pinto, for Joaquim Franco de Mello, a colonel and coffee baron. Along with his wife, Lavinia, and his three sons, Raul, Raphael and Rubens, Franco de Mello occupied the house for most of the early twentieth century. By the 1950s and 1960s, the mansions on Avenida Paulista were being torn down and office buildings and shopping centers were being constructed in their place. The descendants of the coffee barons were selling their desirable Paulista properties off to developers. 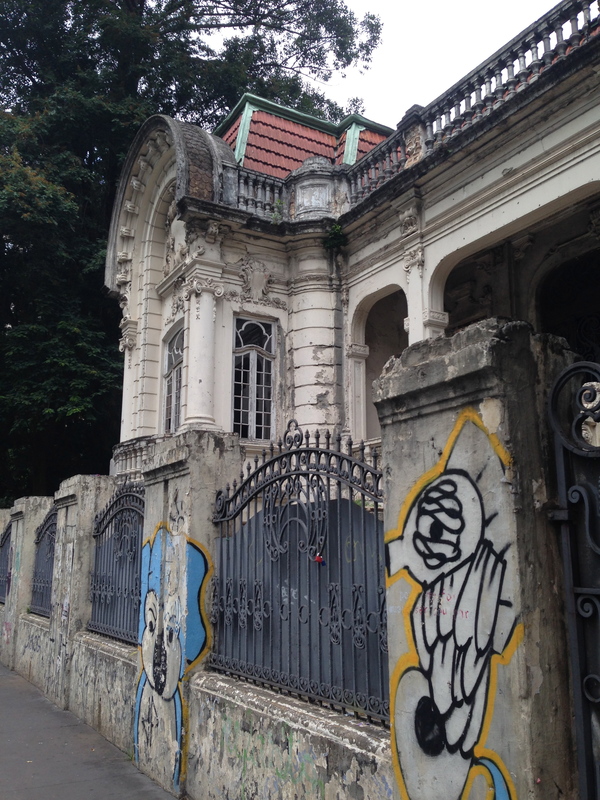 Eventually, the city and state of São Paulo began listing the remaining mansions as historic properties that needed to be preserved pursuant to the historical preservation law of the state of São Paulo and the nation of Brazil. The city listed the Franco de Mello mansion as falling under the historic preservation law in 1992 and in the same year, one of the heirs filed a lawsuit contesting the proposed compensation for the property. Over the next twenty years and more, legal battles between the heirs and the city and state governments ensued over indemnification as well as the preservation and restoration of he mansion. During this period, the mansion did not sit completely abandoned. At various times it has been used for events, exhibitions, a nightclub venue, an animal fair and even a filming location for a horror movie. Recently the condition of the mansion has deteriorated, evidenced by vegetation growing on the sides of the house, broken windows and peeling paint. Fortunately however, the tangled and lengthy lawsuit between the government and the heirs, worthy of comparison to the interminable chancery proceedings in the Charles Dickens novel Bleak House, has recently concluded. In early May 2014, Geraldo Alckmin, the governor of the state of São Paulo, announced that the mansion would become the exhibition space for the Museu da Diversidade Sexual (Museum of Sexual Diversity), a museum which currently operates out of the República Metro Station. The announcement coincided with the Parada do Orgulho LGBT (Gay Pride Parade), a parade that annually and colorfully fills Avenida Paulista with thousands of spectators. The parade took place in early May this year to avoid conflict with the FIFA World Cup. Cities constantly evolve over time. São Paulo has seen its share of change through waves of immigration and changing fortunes. Historic preservation helps places like São Paulo preserve important symbols of their heritage before the desire for all things new erases them forever. It is fortunate that São Paulo succeeded in preserving the Residência Joaquim Franco de Mello. Today, only four mansions from the early days of Avenida Paulista exist today. Moreover, it is notable that this relic of Avenida Paulista’s past is being put to a very modern use in appreciation of the LGBT community, an integral part of the city of São Paulo. of Antonio Fernandes Pinto (the architect), visiting Sao Paulo, and I knew there was a family connection to this house. Unfortunately it is now 4 years after your post and not much has happened – the house still looks like it could collapse at a moment’s notice!